Time for round two! You lucky kids. So the last blog post had the body split up the Delsarte way. Head, heart, & body (or, as a commenter before had mentioned, mental, moral, & vital.) Head, torso, limbs–each with three more splits of the same. And, in those sections, there are even more divisions! The eyes, for example, are split: head in pupil, iris is heart, and white is body. Hands (the head part of the body section) also have three parts: palm = body, back = heart, side = head. The power & movement behind the head/heart/body divisions also had those three parts. 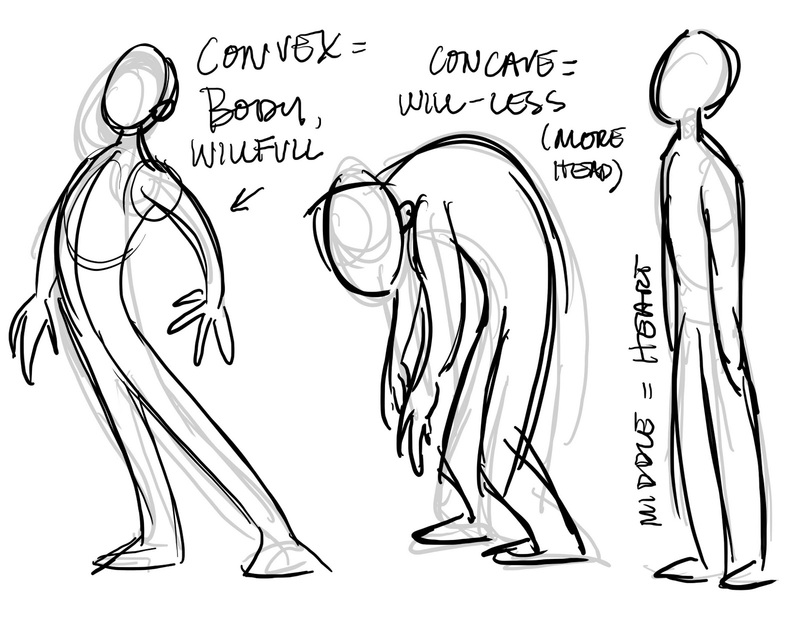 The more powerful and convex is body, the least powerful, more head = concave, and the happy middle is the heart. Delsarte took all these movements & pieces and created exercises and gestures that symbolized the characters’ emotions & desires. 2) 2 is strongly romantic, with both hands in the heart zone, and the hair ending in the heart zone as well. Her arms are bent in more of a head way (Arms out = body, arms square = heart, and arms acute = head) which tempers the romantic with concave shyness (concave, head). ^^ These examples are really terrible. You’re welcome. Ok so below we have our good friend the 1925 phantom, and then a Charlie Chaplin film. The tone of these two pictures are strikingly different. Beyond the phantom trying to get Christine to Do It His Way & Charlie is giving the girl something, you can figure out why the emotions are so different using Delsarte. The logic part of the Phantom, with dark rings around his eyes, makes him look eccentric. His gesture is splayed, which is very physical and forceful, and his hands are in the heart zone (almost in the head zone) making him look forceful, in love & complete fruit loops. 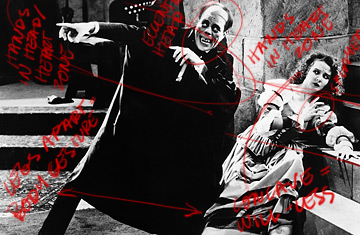 Staging and values help that out, where he’s a dark figure towering over poor will-less, frightened (eyes and splayed fingers) & very romantic-feeling (both hands in heart zone) Christine. Both of these characters are on equal standing–heart and head. Both of them are in concave, less willful gestures. Charlie has one hand in head, one hand in heart. The girl’s cupped hand = less force, hand in heart zone, a concave gesture of kneeling (a 90 degree heart gesture, leaning towards head). Her left hand is in the body zone, but with the back out. So the picture has a very romantically sweet feel to it. Next time: Colors and applications! I took 4 semesters of American Sign Language in college, and it would be really interesting to look and see how signs correlate to this as well. Naturally not all will, but in sign language where you hold a sign on your body (like at your heart or head) changes the meaning. Cool stuff! Wow Heather these are so GREAT! 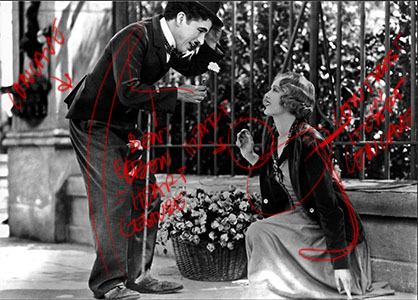 Thanks a million for sharing this info – as an animator this stuff is gold. And you are so brilliantly funny to read. : ) I can't wait for the color one I am that much of a nerd! @Debbie – That is really interesting! Are the signs in the head area more logical, vs more emotional in the heart? (I would assume they are…) When was asl developed? Heehee, Gollim and the Phantomake me laugh.